The Stairway Trolley Shop is an extremely manoeuvrable mobile shop trolley and widely used in hospitals by League of Friends and RVS to use in providing a hospital trolley shop service on hospital wards. 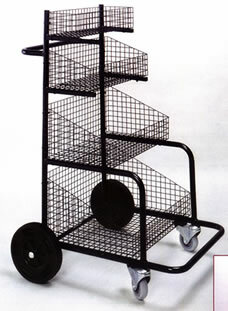 The trolley shop has four graduating baskets and a push handle, mounted on 100mm (4″) braking castors at the front and 250mm (10″) heavy duty wheels at the rear. A cash box and flame retardant cover in the colour of your choice, are available as optional extras.